Popular rack maker Thule acquired Sportworks in the latter part of 2005 and continued production of the very successful line of Sportworks racks that are famous for their quick load features. The Sportworks racks had always been known for their ease of use and ability to hold any bike you may have. Thule only changed the paint scheme of the racks and added their insignias to the products � but maintained the original Sportworks designs. Derailed has conducted a very extensive and long term review of the Thule T2 rack, leaving "no stone unturned" in this article. We wanted to put this rack through it's paces and see what happens in the rear world use of this bike rack. My review of this rack spans over a year of continual use in many different environments, long haul bike trips, and numerous days of DH shuttling. Imitation is the best form of flattery. 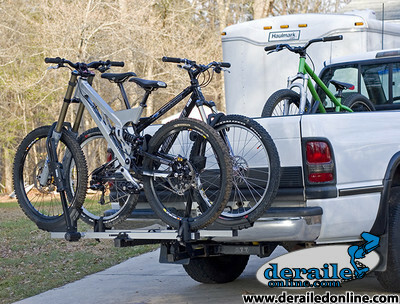 The quick load design of the Thule rack has been imitated by most every other manufacturer on the market. What sets the T2 apart from all the other racks is the rock solid design and strength. No shortcuts are taken in the construction of the T2 rack. The square tubing used for the main structure is very thick walled and the hinge points pivot on brass bushings (Figure 3.) with very large pivot bolts and thick link plates. The spring loaded, multi link design of the rack�s flip-up pivot is very well built and designed (Figure 2.). There is no deflection in the main structure of the rack when loaded. Thule reports a capacity of 60lbs per bike per tray. The main structure of the rack can hold that much weight and far more. The rack comes standard with two trays and the option to add an extension with two more trays (2� hitch version only). The trays are also of solid construction. The main part of the tray is square tubing on which the rear wheel holder slides to adjust to wheelbase of the bike (Figure 4.). The other end of the tray has a plastic tray to hold the front wheel and the classic front tire hook that secures the bike to the rack (Figure 5.). Thule includes a handy wrench and Allen key that fits all the hardware on the rack. It�s a great tool to keep in whatever vehicle you use the rack on and even has a bottle opener incorporated into the tool! The paint finish on the rack is decent, but some scratches in the paint will develop over long term use so touch up paint would be highly recommended. Loading and unloading of bikes is fast and painless (see video below); so fast that it makes a great accessory to a truck used for shuttling, giving you two additional bikes that can be transported. 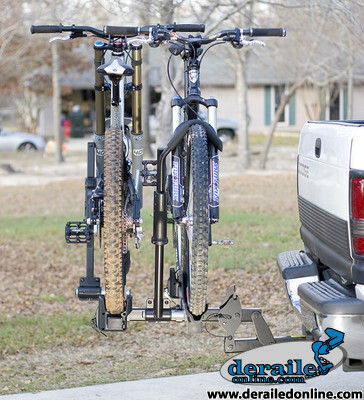 The rack has the ability to hold any tire size you have on your bike. Whether it be a road bike, 20� BMX bike, or a DH bike with Michelin Comp32 (2.8 size) tires, the T2 rack secures the bike despite the tire size or wheel diameter. The rear wheel sliding binder is a great improvement from the older design that basically used a plastic ring that spun about the tray. While the binding strap may not be as fast as the older plastic ring is holds the rear wheel more securely and accommodates all tire sizes. 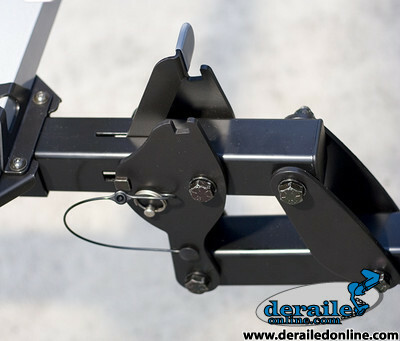 Thule did address a problem that many hitch mounted racks face � wobble. Thule uses a bolt to secure the rack into the receiver hitch on the vehicle. While this does dramatically cut down on the wobble of the rack inside the hitch it adds an issue of concern about the rack. There is no fail safe method of keeping the rack in the hitch. The rack comes with a bolt, washer, and split ring lock washer to secure the rack to the vehicle. Even with lock washers, bolts can work themselves loose, especially on something like a bike rack that that undergoes constant shaking and rattling. I frequently checked the security of this bolt and often found it not as tight as when I installed it. There is no use of a cotter pin or hair pin that will keep the rack into the receiver hitch of the vehicle should be bolts work loose. However, it should be said that with any bike rack the security of the bolts should always be checked for safety. 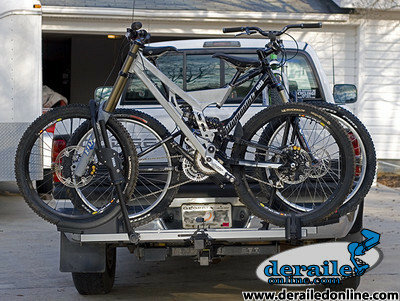 Thule has a lock for all hitch racks that is highly recomended. This lock - Snug-Tite Lock 2 STL2 (Figure 7.) 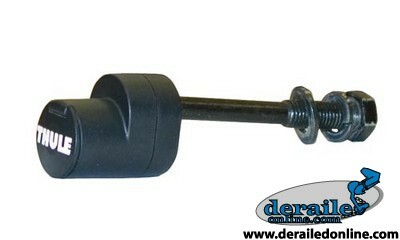 - offers a level of security in case the bolt were to back completely out the rack can not come detached from the vehicle. The tire hooks are padded to eliminate damage to the fork of the bike; however, chaffing still occurs and can eventually sand the finish off your fork in the two locations it touches the leg. Rear wheels are held in place by the sliding tray that incorporates a ratcheting binding strap. The strap can be completely removed from the sliding tray which can be an issue when your friends are using the rack as I had the straps completely removed several times when unloading bikes. Simple fix to keep this from happening again was the drill a hole in the end of the strap and run a zip tie through the strap into a loop. Some things to note about fork compatibility. The padding on the Thule rack does not comletely cover the hooks enough to protect paint scuffs from contact with the metal hooks on Marzoochi lowers that are part of the 888 and 66 fork families. 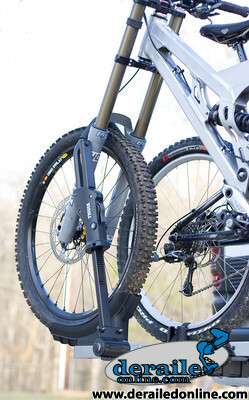 Forks with large lowers such as the Fox DH40 and Rockshox Totem can rub on the mast of the tire hooks on the exterior of the fork near the fork seals. You must add extra padding to the rack in these cases to keep from the rack chaffing the paint off the fork. 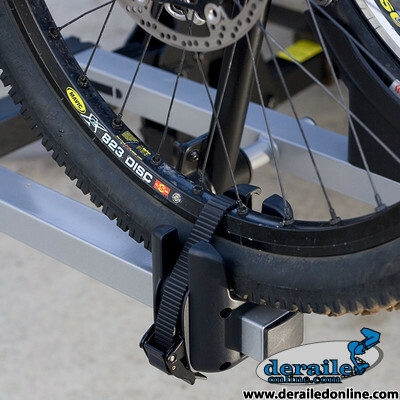 Each tray is adjustable in its position on the main support to allow you to eliminate any interference between the saddles and handlebars of the bikes. The trays are held onto the tubing by four Allen bolts. As with the hitch mounting, I would have liked to have seen some fail safe device to keep the trays onto the main tubing to prevent the trays from sliding off the end of the main tubing were they to come loose during a trip. 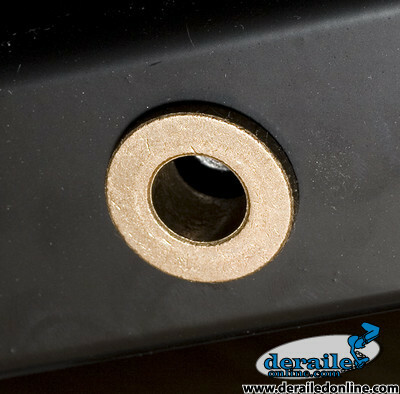 Considering the potentially catastrophic consequences of one of the trays sliding off the end of the hitch shaft while on the road, potential buyers should be very aware that they should check the mounting hardware EVERY TIME they use the rack and I�d strongly urge Thule to consider adding cotter pins or some other sort of back-up failsafe mechanism to the tray mounts. As with all Thule products the T2 rack accepts the standard Thule lock cores on each hook and Thule also offers a locking bolt for securing the rack into the hitch and preventing theft of the entire rack. Every part of the rack is replaceable directly from Thule should anything be damaged or lost. Among all the hitch mount racks I have come across, the Thule T2 rack is one of the best racks for simplicity of design, easy of use, and strength. 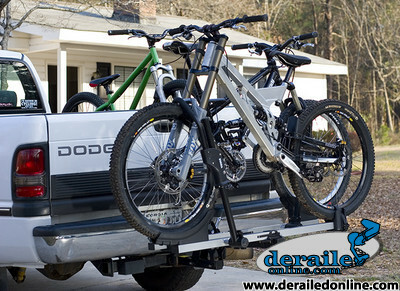 The T2 rack is one the most adaptable designs for carrying bikes on the market. Its ability to adapt to any bike and still maintain quick loading times is the best feature of the rack. Functionally, the rack receives the highest marks. The only problem found with the rack is the lack of some piece-of-mind fail safe devices incorporated into the design of the rack. Long term use of the rack was flawless with no maintenance issues at all. Below is a video to illustrate the ease of use of the Thule T2. Photo gallery of review photos can be found here. Posted on Sep 20, 2007 16:22:44 -0400 by Brady.